Cycling is not only discovering beautiful landscapes in the mountains or by the sea. Cycling is also curiosity, culture, gastronomy, good climate, different sites, people, cycle paths, including urban and slow cycling. A metropolis like Barcelona is a universal destination, and an especially appealing city to be discovered on a bicycle. Barcelona is one of the most powerful brands that exist in the world of tourism today. The number of visitors is growing every year, even with the crisis. Also theb number of hotels is increasing, more than 350 establishments, 65,000 hotel beds. Is there something more appealing that wandering in bicycle in Barcelona Maritime front from Sant Adrià del Besòs until Hotel Vela, passing through the area of the Forum, the Vila Olimpica area and Barceloneta? Few things are comparable to this experience, so there are thousands of people who every day make that journey on cheap bikes, urban bikes, electric bikes, mountain bikes, Dutch bikes, and even in ours, in road bikes. The purpose is to enjoy the breeze, the views, the smell of the sea. Yes, definitely Barcelona is also a high level destination for cyclists. Maybe not in the sense that we are used to, winter cycling stages in warm areas by the sea, to train hard, but in a broader, more touristic, more global sense. On the other hand Barcelona is a city closely tied to the professional cycling world for many years. We do not need to mention the most known Barcelona event, the 1992 Olympics, whose cyclist road race was not held in Barcelona but in Vilafranca del Penedès, with the victory of the unfortunated Fabio Casartelli. Barcelona was also end of stage at the Tour de France in 2009, how to forget that? The rain marred the day, but the citizen participation was again rated ten. The stage came from Girona and the finish was at the Olimpic Stadium. The victory was for Hushovd ahead of spaniards Freire and Rojas. Montjuïc is a mountain married to the sports: Olympic Stadium, Palau Sant Jordi, Olympic Museum, Picornell swimming pools (that ones with impressive views of the jumpers and Barcelona in the background). And beyond sports Montjuic has so many things to see, the MNAC (Museu Nacional d’Art de Catalunya), the Palau Nacional o Poble Espanyol. Hundred per cent touristic. Cycling in Barcelona is also mentioning the most remarkable mountain in the city: the Tibidabo. Tibidabo is the first destination for every cyclist living in Barcelona, and the place to test himself. The mountain is visible from all over the city, with its church illuminated at night, offering an incredible and beautiful show. The amusement park next to the summital church closes a perfect circle that brings children to the mountain from the early childhood. What about climate in Barcelona? In this wonderful city we can cycle all year long. 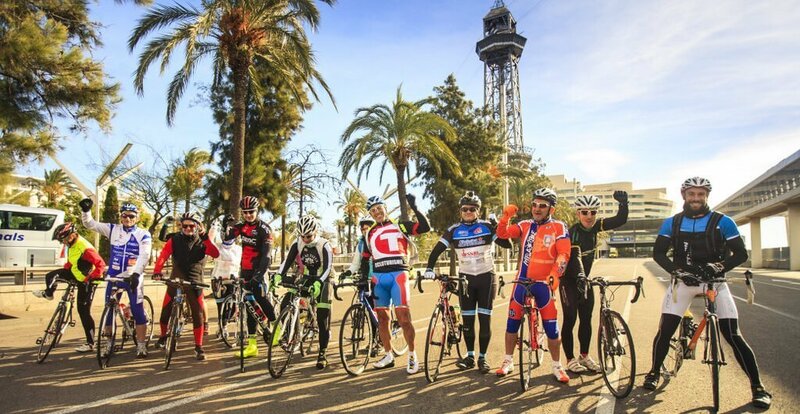 Even in the most raw winter days, Barcelona cyclists lead north via NII by the coast direction Costa Brava, and lead south direction Sitges, searching the shores of Garraf. Weekends of all the year, the main roads going out of the city are packed with cyclists. We have been talking about Barcelona as a touristic destination and still have not spoken about the Sagrada Familia, the Casa Batlló, La Pedrera, Parque Güell, the Cathedral, Borne, La Boqueria, the Liceu, Las Ramblas, Camp Nou… All these attractions can be discovered much better upon a bike, rather tan driving (impossible! ), walking or by public transport. With all the pieces that we have named so far, and many more it is possible to put together a route around the city in about 70 kilometers including some touristic attractions but also some demanding climbs. But if you go to Barcelona, it would be a pity not visiting some interesting places nearby (from de cyclist prospective). First one is Montserrat, the holy mountain for Catalan people, one of the greatest touristic attractions of the country. And also a real challenge to climb up there. Did you know that climbing there to rengrace the black Virgin of Montserrat is a classic among the catalan people? Do you want to pray for anyone or anything? Then you are in the right place. The views of the mountain are spectacular! Another interesting area is Penedes. The comparison with the italian Tuscany is too obvious. The problem would be to know which one is the nicest area to ride your bike. Vineyards, solitaire roads, mild weather, soft climbs… Is there a paradise for cyclists? It should be not far from there. Visiting the wineries, the well known catalan cava, and remembering the old saga Falcon Crest… All in all, just minutes way from Barcelona! Last but not least. Montseny mountain is really close to Barcelona. You can reach it from the big city in hardly 70 km. The highest elevation of Montseny is Turo de l’Home, at 1700 meters. One of the steepest roads in whole Catalonia, a real challenge for strong cyclists. But no need to climb up to the top. You can reach Coll Formic or Santa Fe del Montseny, solitaire roads climbing the mountain in which you can enjoy incredible landscapes, specially in autumn. Barcelona is a cosmopolitan city that awaits you all year long to ride the bike and also to learn so many interesting things. A city that is worth visiting. No doubt! Next postGuided tours around Montserrat, amazing!